El hipoparatiroidismo es un trastorno del metabolismo del calcio infrecuente. La principal etiología es la posquirúrgica en el 75% de los casos. El hipoparatiroidismo crónico tiene una prevalencia estimada de 20-40 por cada 100.000 habitantes. Las manifestaciones clínicas varían desde cuadros asintomáticos hasta neuromusculares, neurológicas, cognitivas, cardiacas y disminución en la calidad de vida. El tratamiento estándar es la suplementación de calcio y calcitriol. Es frecuente la refractariedad a este enfoque terapéutico y se asocia a una alta incidencia de efectos adversos por las altas dosis de suplementos requeridas. Hasta hace poco era la única deficiencia endocrina no tratada con terapia de sustitución hormonal. Recientemente, la FDA ha aprobado el uso de la PTH recombinante (1-84) para el tratamiento del hipoparatiroidismo refractario. Hay dos análogos de PTH disponibles (PTH 1-84 y PTH 1-34). Ambas moléculas se han asociado a una disminución en los requerimientos de suplementación con calcio y calcitriol, manteniendo concentraciones estables de calcio sérico y fosfato, mejor calidad de vida y un metabolismo óseo más fisiológico con una baja incidencia de efectos adversos. Actualmente, la terapia de sustitución hormonal con PTH no hace parte del tratamiento de rutina del hipoparatiroidismo y tiene unas indicaciones estrictas. 1. Zea Lopera J, Londoño Tabares S, Builes-Barrera C, Sanabria A, Román-González, A. Pilares para el enfoque y tratamiento adecuado del paciente con hipoparatiroidismo. Iatreia. 2018;31(2):155-65. 2. Büttner M, Musholt TJ, Singer S. Quality of life in patients with hypoparathyroidism receiving standard treatment: a systematic review. Endocrine. 2017;58(1):14-20. 3. Arlt W, Fremerey C, Callies F, Reincke M, Schneider P, Timmermann W, et al. Well-being, mood and calcium homeostasis in patients with hypoparathyroidism receiving standard treatment with calcium and vitamin D. Eur J Endocrinol. 2002;146(2):215-22. 4. Stack BC, Bimston DN, Bodenner DL, Brett EM, Dralle H, Orloff LA, et al. American Association Of Clinical Endocrinologists And American College Of Endocrinology Disease State Clinical Review: Postoperative Hypoparathyroidism--Definitions And Management. Endocr Pract. 2015;21(6):674-85. 5. Clarke BL, Kay Berg J, Fox J, Cyran JA, Lagast H. Pharmacokinetics and pharmacodynamics of subcutaneous recombinant parathyroid hormone (1-84) in patients with hypoparathyroidism: an open-label, single-dose, phase I study. Clin Ther. 2014;36(5):722-36. 6. Rejnmark L, Underbjerg L, Sikjaer T. Hypoparathyroidism: Replacement Therapy with Parathyroid Hormone. Endocrinol Metab (Seoul). 2015;30(4):436-42. 7. Bilezikian JP, Brandi ML, Cusano NE, Mannstadt M, Rejnmark L, Rizzoli R, et al. Management of Hypoparathyroidism: Present and Future. J Clin Endocrinol Metab. 2016;101(6):2313-24. 8. Shoback DM, Bilezikian JP, Costa AG, Dempster D, Dralle H, Khan AA, et al. Presentation of Hypoparathyroidism: Etiologies and Clinical Features. J Clin Endocrinol Metab. 2016;101(6):2300-12. 9. Brandi ML, Bilezikian JP, Shoback D, Bouillon R, Clarke BL, Thakker RV, et al. Management of Hypoparathyroidism: Summary Statement and Guidelines. J Clin Endocrinol Metab. 2016;101(6):2273-83. 10. Bilezikian JP, Khan A, Potts JT, Brandi ML, Clarke BL, Shoback D, et al. Hypoparathyroidism in the adult: epidemiology, diagnosis, pathophysiology, target-organ involvement, treatment, and challenges for future research. J Bone Miner Res. 2011;26(10):2317-37. 11. Cocchiara G, Cajozzo M, Fazzotta S, Palumbo VD, Geraci G, Maione C, et al. [Risk factors’ analysis of transient and permanent hypoparathyroidism after thyroidectomy]. Clin Ter. 2017;168(4):e271-e7. 12. Powers J, Joy K, Ruscio A, Lagast H. Prevalence and incidence of hypoparathyroidism in the United States using a large claims database. J Bone Miner Res. 2013;28(12):2570-6. 13. Clarke BL, Brown EM, Collins MT, Jüppner H, Lakatos P, Levine MA, et al. Epidemiology and Diagnosis of Hypoparathyroidism. J Clin Endocrinol Metab. 2016;101(6):2284-99. 14. Underbjerg L, Sikjaer T, Mosekilde L, Rejnmark L. The Epidemiology of Nonsurgical Hypoparathyroidism in Denmark: A Nationwide Case Finding Study. J Bone Miner Res. 2015;30(9):1738-44. 15. Vadiveloo T, Donnan PT, Leese GP. A Population-Based Study of the Epidemiology of Chronic Hypoparathyroidism. J Bone Miner Res. 2018;33(3):47885. 16. Underbjerg L, Sikjaer T, Mosekilde L, Rejnmark L. Postsurgical hypoparathyroidism--risk of fractures, psychiatric diseases, cancer, cataract, and infections. J Bone Miner Res. 2014;29(11):2504-10. 17. Underbjerg L, Sikjaer T, Mosekilde L, Rejnmark L. Cardiovascular and renal complications to postsurgical hypoparathyroidism: a Danish nationwide controlled historic follow-up study. J Bone Miner Res. 2013;28(11):227785. 18. Sikjaer T, Moser E, Rolighed L, Underbjerg L, Bislev LS, Mosekilde L, et al. Concurrent Hypoparathyroidism Is Associated With Impaired Physical Function and Quality of Life in Hypothyroidism. J Bone Miner Res. 2016;31(7):1440-8. 19. Clarke BL. Bone disease in hypoparathyroidism. Arq Bras Endocrinol Metabol. 2014;58(5):545-52. 20. Cipriani C, Abraham A, Silva BC, Cusano NE, Rubin MR, McMahon DJ, et al. Skeletal changes after restoration of the euparathyroid state in patients with hypoparathyroidism and primary hyperparathyroidism. Endocrine. 2017;55(2):591-8. 21. Albright F, Ellsworth R. STUDIES ON THE PHYSIOLOGY OF THE PARATHYROID GLANDS: I. Calcium and Phosphorus Studies on a Case of Idiopathic Hypoparathyroidism. J Clin Invest. 1929;7(2):183-201. 22. Sikjaer T, Amstrup AK, Rolighed L, Kjaer SG, Mosekilde L, Rejnmark L. PTH(1-84) replacement therapy in hypoparathyroidism: a randomized controlled trial on pharmacokinetic and dynamic effects after 6 months of treatment. J Bone Miner Res. 2013;28(10):2232-43. 23. Winer KK, Zhang B, Shrader JA, Peterson D, Smith M, Albert PS, et al. Synthetic human parathyroid hormone 1-34 replacement therapy: a randomized crossover trial comparing pump versus injections in the treatment of chronic hypoparathyroidism. J Clin Endocrinol Metab. 2012;97(2):391-9. 24. Mannstadt M, Clarke BL, Vokes T, Brandi ML, Ranganath L, Fraser WD, et al. Efficacy and safety of recombinant human parathyroid hormone (1-84) in hypoparathyroidism (REPLACE): a double-blind, placebo-controlled, randomised, phase 3 study. Lancet Diabetes Endocrinol. 2013;1(4):275-83. 25. Rubin MR, Cusano NE, Fan WW, Delgado Y, Zhang C, Costa AG, et al. Therapy of Hypoparathyroidism With PTH(1-84): A Prospective Six Year Investigation of Efficacy and Safety. J Clin Endocrinol Metab. 2016;101(7):2742-50. 26. Clarke BL, Vokes TJ, Bilezikian JP, Shoback DM, Lagast H, Mannstadt M. Effects of parathyroid hormone rhPTH(1-84) on phosphate homeostasis and vitamin D metabolism in hypoparathyroidism: REPLACE phase 3 study. Endocrine. 2017;55(1):273-82. 27. Cusano NE, Rubin MR, McMahon DJ, Zhang C, Ives R, Tulley A, et al. Therapy of hypoparathyroidism with PTH(1-84): a prospective four-year investigation of efficacy and safety. J Clin Endocrinol Metab. 2013;98(1):137-44. 28. Lakatos P, Bajnok L, Lagast H, Valkusz Z. An open-label extension study of parathyroid hormone rhpth(1-84) in adults with hypoparathyroidism. Endocr Pract. 2016;22(5):523-32. 29. Palermo A, Santonati A, Tabacco G, Bosco D, Spada A, Pedone C, et al. PTH(1-34) for Surgical Hypoparathyroidism: A 2-Year Prospective, OpenLabel Investigation of Efficacy and Quality of Life. J Clin Endocrinol Metab. 2018;103(1):271-80. 30. Cusano NE, Rubin MR, Irani D, Sliney J, Bilezikian JP. Use of parathyroid hormone in hypoparathyroidism. J Endocrinol Invest. 2013;36(11):1121-7. 31. Rosa RG, Barros AJ, de Lima AR, Lorenzi W, Da Rosa RR, Zambonato KD, et al. Mood disorder as a manifestation of primary hypoparathyroidism: a case report. J Med Case Rep. 2014;8:326. 32. Cusano NE, Rubin MR, McMahon DJ, Irani D, Anderson L, Levy E, et al. PTH(1-84) is associated with improved quality of life in hypoparathyroidism through 5 years of therapy. J Clin Endocrinol Metab. 2014;99(10):36949. 33. Cipriani C, Capriani C, Irani D, Bilezikian JP. Safety of osteoanabolic therapy: a decade of experience. J Bone Miner Res. 2012;27(12):2419-28. 34. Andrews EB, Gilsenan AW, Midkiff K, Sherrill B, Wu Y, Mann BH, et al. The US postmarketing surveillance study of adult osteosarcoma and teriparatide: study design and findings from the first 7 years. J Bone Miner Res. 2012;27(12):2429-37. 35. Cusano NE, Rubin MR, Bilezikian JP. PTH(1-84) replacement therapy for the treatment of hypoparathyroidism. Expert Rev Endocrinol Metab. 2015;10(1):5-13. 36. Cusano NE, Anderson L, Rubin MR, Silva BC, Costa AG, Irani D, et al. Recovery of parathyroid hormone secretion and function in postoperative hypoparathyroidism: a case series. J Clin Endocrinol Metab. 2013;98(11):428590. 37. Cusano NE, Rubin MR, Zhang C, Anderson L, Levy E, Costa AG, et al. Parathyroid hormone 1-84 alters circulating vascular endothelial growth factor levels in hypoparathyroidism. J Clin Endocrinol Metab. 2014;99(10):E2025-8. 38. Rubin MR, Zwahlen A, Dempster DW, Zhou H, Cusano NE, Zhang C, et al. Effects of Parathyroid Hormone Administration on Bone Strength in Hypoparathyroidism. J Bone Miner Res. 2016;31(5):1082-8. 39. Zea J, Londoño S, Cardona E, Álvarez D, Gómez J, Rúa C, et al. Resultados preliminares de la caracterización del hipoparatiroidismo en el Hospital Universitario San Vicente Fundación. 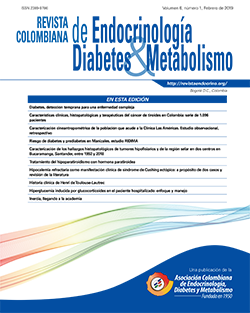 Revista Colombiana de Endocrinología, Diabetes y Metabolismo. 2018;5(2):86-7. 40. Sikjaer T, Rejnmark L, Rolighed L, Heickendorff L, Mosekilde L, Group HS. The effect of adding PTH(1-84) to conventional treatment of hypoparathyroidism: a randomized, placebo-controlled study. J Bone Miner Res. 2011;26(10):2358-70. 41. Rubin MR, Sliney J, McMahon DJ, Silverberg SJ, Bilezikian JP. Therapy of hypoparathyroidism with intact parathyroid hormone. Osteoporos Int. 2010;21(11):1927-34. 42. Rubin MR, Dempster DW, Sliney J, Zhou H, Nickolas TL, Stein EM, et al. PTH(1-84) administration reverses abnormal bone-remodeling dynamics and structure in hypoparathyroidism. J Bone Miner Res. 2011;26(11):272736. 43. Bilezikian JP, Clarke BL, Mannstadt M, Rothman J, Vokes T, Lee HM, et al. Safety and Efficacy of Recombinant Human Parathyroid Hormone in Adults With Hypoparathyroidism Randomly Assigned to Receive Fixed 25-μg or 50-μg Daily Doses. Clin Ther. 2017;39(10):2096-102. 44. Vokes TJ, Mannstadt M, Levine MA, Clarke BL, Lakatos P, Chen K, et al. Recombinant Human Parathyroid Hormone Effect on Health-Related Quality of Life in Adults With Chronic Hypoparathyroidism. J Clin Endocrinol Metab. 2018;103(2):722-31. 45. Winer KK, Sinaii N, Reynolds J, Peterson D, Dowdy K, Cutler GB. Long-term treatment of 12 children with chronic hypoparathyroidism: a randomized trial comparing synthetic human parathyroid hormone 1-34 versus calcitriol and calcium. J Clin Endocrinol Metab. 2010;95(6):2680-8. 46. Winer KK, Sinaii N, Peterson D, Sainz B, Cutler GB. Effects of once versus twice-daily parathyroid hormone 1-34 therapy in children with hypoparathyroidism. J Clin Endocrinol Metab. 2008;93(9):3389-95. 47. Winer KK, Ko CW, Reynolds JC, Dowdy K, Keil M, Peterson D, et al. Long-term treatment of hypoparathyroidism: a randomized controlled study comparing parathyroid hormone-(1-34) versus calcitriol and calcium. J Clin Endocrinol Metab. 2003;88(9):4214-20. 48. Winer KK, Yanovski JA, Sarani B, Cutler GB. A randomized, cross-over trial of once-daily versus twice-daily parathyroid hormone 1-34 in treatment of hypoparathyroidism. J Clin Endocrinol Metab. 1998;83(10):3480-6. 49. Winer KK, Yanovski JA, Cutler GB. Synthetic human parathyroid hormone 1-34 vs calcitriol and calcium in the treatment of hypoparathyroidism. JAMA. 1996;276(8):631-6. 50. Sikjaer T, Rejnmark L, Thomsen JS, Tietze A, Brüel A, Andersen G, et al. Changes in 3-dimensional bone structure indices in hypoparathyroid patients treated with PTH(1-84): a randomized controlled study. J Bone Miner Res. 2012;27(4):781-8. 51. Sikjaer T, Rolighed L, Hess A, Fuglsang-Frederiksen A, Mosekilde L, Rejnmark L. Effects of PTH(1-84) therapy on muscle function and quality of life in hypoparathyroidism: results from a randomized controlled trial. Osteoporos Int. 2014;25(6):1717-26. 52. Santonati A, Palermo A, Maddaloni E, Bosco D, Spada A, Grimaldi F, et al. PTH(1-34) for Surgical Hypoparathyroidism: A Prospective, Open-Label Investigation of Efficacy and Quality of Life. J Clin Endocrinol Metab. 2015;100(9):3590-7.